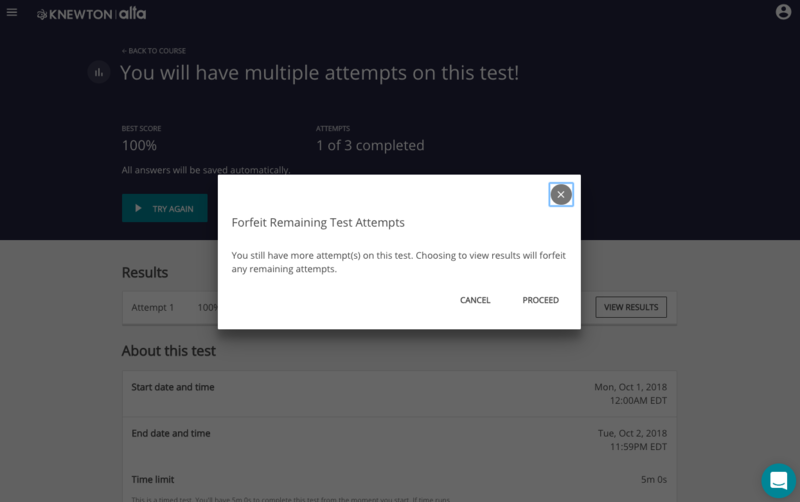 Enabling multiple attempts for tests allows your students another chance to get an improved score. Before students begin work and before a test’s due date, you are able to choose how many times your students may reattempt a test, and they will keep the best score out of all attempts as their final grade. If you use a learning management system (LMS), your gradebook will update with each new student submission that is better than previous attempts. Check out this article for information on these settings! Students are not required to use all their given attempts. If they’re satisfied with their score and wish to complete the test and 'View Results', they will be asked if they choose to forfeit their remaining test attempts. They will then be able to see the correct and incorrect answers after the due date passes. Students will always be able to see their attempt scores to help make a decision on further attempts. 1. Navigate to your Course Outline. Click Manage to edit it, then click Add. 3. Begin creating a test. Once you’ve named it and customized it to your liking with topics and learning objectives, navigate to the Settings tab. 4. Scroll down to the Features box. From here, click the toggle next to Multiple Attempts. 5. 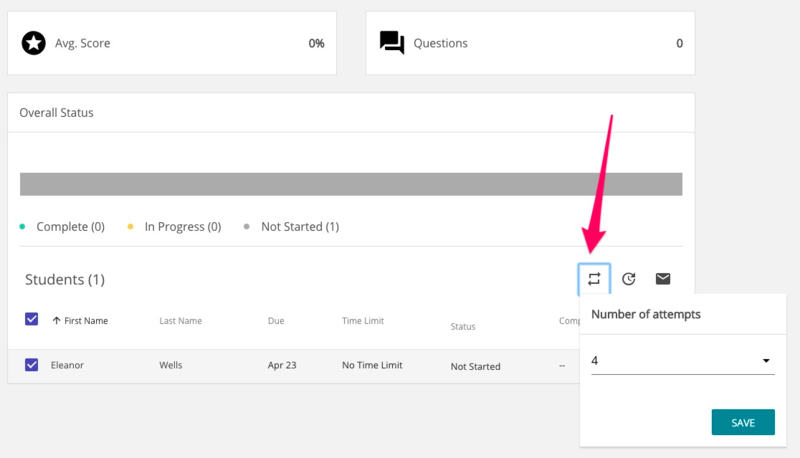 Next, you can choose from the dropdown menu on the left how many attempts total you’d like to give your students. You can choose up to 10 attempts. 6. Click Done at the top of the page to finalize your test! 1. Navigate to your Course Outline. Click Manage to edit it, then click the three dots next to the test for which you’d like to enable multiple attempts. Click Edit. 3. Scroll down to the Features box. From here, click the toggle next to Multiple Attempts. 4. Next, you can choose from the dropdown menu on the left how many attempts total you’d like to give your students. You can choose up to 10 attempts. 5. Click Done at the top of the page to finalize your test! 1. Navigate to the correct section and click the Coursework tab. Click into the Test Score card. 2. Select the test in question from the list. 3. Check the box next to the student(s) to whom you’d like to give more attempts. 4. Click the two-arrow button at the top of the student name list and choose how many attempts you’d like to grant! Click Save.